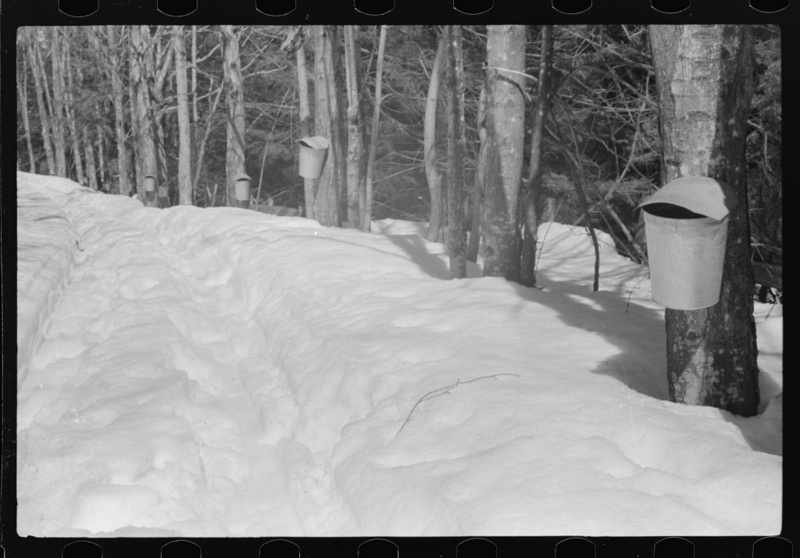 Once upon a time, almost every farm in New England had a small sugarbush–that is, a grove of sugar maples that were kept as a source of sap to be boiled down into syrup and sugar. The old wooden buckets gave way to galvanized steel pails and eventually to plastic tubing, and in the bigger operations reverse-osmosis sap-concentrating machines have partly supplanted the wood-fired evaporator pans. But most smaller maple farms still boil their own sap the old-fashioned way, and some still hang out a few pails, at least on their more visible trees. Range View Farm, Sandwich, NH The Carlsons have a small sugaring operation on their farm on Vittum Hill Road in Sandwich. Their traditional saphouse turns out top-quality syrup in small quantities. It’s also available online, though I don’t know how frequently they update their website. Sugarbush Farm, Quechee, VT This place makes a fair amount of maple syrup and has other maple products available, as well as making their own cheeses–you can stop in any time of year for a cheese tasting. Not cheap, but good. The farm is pleasantly located, too, at the end of a dead-end road at the foot of a small mountain. Weston’s Farm, Fryeburg, ME Located right by the Saco River just on the outskirts of Fryeburg, Weston’s Farm runs a couple of locally prominent farmstands in the summer, in addition to producing maple syrup and hay and Christmas trees and various other products. Hilltop Boilers, Newfield, ME A sugaring operation whose proprietor happens to be the webmaster (and treasurer and secretary) of the Maine Maple Producers Association. Not surprisingly, they have a very nice website. Located in the Cumberland County foothills. Bacon Farm, Sidney, ME Described on their website as being in their sixth generation of operation. Balsam Ridge Farm, Raymond, ME Primarily a Christmas tree farm, Balsam Ridge also has a sugarhouse and sells syrup and other maple products. Bob’s Sugar House, Dover-Foxcroft, ME Somehow these folks landed the domain name mainemaplesyrup.com. Bradbury Maple Farms, Bridgewater, ME The farm has been in the family for generations and had produced syrup in the past, but according to their website they only started sugaring again in the early 1980s. Good luck to them! Breakneck Ridge Farm, Blanchard, ME Their main web page features pictures of the bison they ranch, but they make maple syrup too. Chandler’s Sugar Shack, Topsfield, ME A fairly new sugaring operation, in an out-of-the-way location. Website here. Cooper’s Maple Products, Windham, ME A horse farm that also sells maple syrup. Dad’s Maple Sugar Shack, Harrison, ME A small-scale producer. They have a Facebook page. Dole Pond Maple Products, Dole Brook Township, ME A big operation way out in the woods. Grandpa Joe’s Sugar House, East Baldwin, ME Their website is here. Hall Farms, East Dixfield, ME Their maple business is based in part out of an old schoolhouse. They also have a dairying operation. Harvest Hill Farms, West Poland, ME They have lots of irons in the fire, agriculturally speaking–beef, vegetables, maple products–they even make pizza. See their website for details. Haulk’s Maple, Madison, ME A relatively new operation, founded only in 2000. Hidden Fortune Farm, Jefferson, ME They raise sheep and chickens in addition to making syrup. Website here. Jillson’s Farm & Sugarhouse, Sabattus, ME Website here. Kinney’s Sugarhouse, Knox, ME “One of the largest maple sugar candy producers in the state of Maine,” with 185 acres of sugarbush in production, according to their website. Maine Mountain Maple Products, Rangeley, ME Their website is rather extravagntly tricked out with technological bells and whistles, but no doubt the syrup they produce still has the old-fashioned flavor. Maine Sugarworks, Strong, ME They advertise their product as being darker and more flavorful than other commercially-produced product, due to a longer boil with more caramelization of the sugars in the sap. Mitchell & Savage Farm, Bowdoin, ME A small operation, turning out only 125 to 150 gallons a year, according to their website, which has nice photos of them using a horse-drawn sledge to collect their sap. Moonlight Maple Company, Mount Vernon, ME Website here. Nutkin Knoll Farm, Newburgh, ME A Christmas-tree farm that also makes their own syrup. Website here. Real Good Maple Syrup, Bowdoinham, ME You’ve got to love the name! Sawyer’s Maple Farm, Jackman, ME A rather new operation–according to their website, they started sugaring in 2010. Spring Break Maple and Honey, Smyrna, ME Website here. Tessier’s Farm, Skowhegan, ME A small family farm with a small sugaring operation. Website here. Thurston and Peters Sugarhouse, West Newfield, ME A modern operation, with oil-fired evaporator and reverse osmosis machine. Website here. Wentworth Hill Farms, Brooks, ME Website here. Cormier’s Sugarhouse, Alton, NH Website here. Green Acres Farm, Tilton, NH Website here. 100 Acre Wood, Intervale, NH A sugarhouse operated by the Believbe in Books Literacy Foundation. Website here. Olkkola Farm Saphouse, Ossipee, NH Website here. Turkey Street Maples, Tamworth, NH Website here. Young Maple Ridge Sugarhouse, North Sandwich, NH Website here. Fieldstone Farm, Rindge, NH Website here, touting the fact that their syrup is boiled on a wood-fired arch. Stonewall Farm Sugar House, Keene, NH Stonewall Farm is a nonprofit farm and educational center. They make maple syrup among many other projects. Bisson’s Sugar House, Berlin, NH In operation since 1921, Bisson’s still uses a wood-fired evaporator, according to their website. Fuller’s Sugarhouse, Lancaster, NH Website here. Tilton’s Sugarhouse, Groveton, NH A fairly new operation (founded in 2000), with vacuum extraction and reverse osmosis. Website here. Benton’s Sugarshack, Thornton, NH A fifth-generation maple farm. Website here. Fadden’s General Store & Maple Sugarhouse, North Woodstock, NH Website here. Mount Cube Farm, Orford, NH A family oepration since 1954. Website here. The Rocks Estate Sugar House, Bethlehem, NH A sugaring operation run by the Society for the Protection of New Hampshire Forests, which also grows Christmas trees on the estate. Website here. Ben’s Sugar Shack, Temple, NH Website here. Nature’s Sweet Secret Sugarhouse, Goffstown, NH The Carons run a small-scale operation–only 400 taps. (The big guys run thousands of taps, or tens of thousands.) Website here. Parker’s Maple Barn, Mason, NH Website here. The Maple Guys, Lyndeborough, NH They make syrup and also sell sugaring equipment. Website here. Journey’s End Maple Farm, Pittsfield, NH A small, second-generation sugaring operation. Website here. Ledgetop Sugar House, Boscawen, NH Website here. Maple Ridge Sugar House, Loudon, NH Website here. Mapletree Farm, Concord, NH Website here. Sunnyside Maples, Loudon, NH Website here. Tamarack Farm, Canterbury, NH Website here. Windswept Maples Farm, Loudon, NH A family farm since 1780, according to their website here. Folsom’s Sugarhouse, Chester, NH Making syrup since 1991. Website here. Willow Creek Sugarhouse, East Kingston, NH A very new operation–founded in 2009! Wilson’s Sugarhouse, Brentwood, NH Website here. Forty to One, Farmington, NH Website here. Spring Harvest Maple Farm, Barrington, NH Website here. Taylor Brother Sugarhouse & Creamery, Meriden, NH They make maple syrup and have dairy cows. Website here. Valley View Maple Farm, Springfield, NH Website here. Eastman Long & Sons, Waitsfield, VT Website here. Center Hill Maples, Barnet, VT Website here. Jed’s Maple Products, Westfield, VT Website here. Vermont Trade Winds Farm, Shoreham, VT Website here. Dakin Farm, Ferrisburgh, VT Website here. Little Charlie’s Sugarbush, Jay, VT Website here. Tucker Maple Farm, Westford, VT Website here. Mount Mansfield Maple Products, Colchester, VT Website here. Nebraska Knoll Sugar Farm, Stowe, VT Website here. Limlaw Family Maple Farm, West Tospfield, VT Website here. Deer Ridge Maple, Derby, VT Website here. Quarry Hill Farm, Jeffersnoville, VT Website here. Evans Maple Farm, East Dummerston, VT Website here. Morse Farm, Montpelier, VT Website here. Butternut Mountain Farm, Johnson, VT Website here. Williams Farms, Cornwall, VT Website here. Andersonville Maple, West Glover, VT Website here. Boyden Farm, Cambridge, VT Website here. McBride Family Maples, Westford, VT Website here. Judd’s Wayeeses Farm, Morgan, VT Website here. Bragg Farm, East Montpelier, VT Eighth-generation maple farmers. Website here. Sweet Maple Alpaca Farm, Westminster, VT As the name implies, they’re an alpaca farm that also produces maple syrup. Website here. Green Mountain Sugar House, Ludlow, VT Website here. Above the Notch Maple Syrup, Lowell, VT Website here. Couture’s Maple Shop, Westfield, VT Website here. Vermont Highlands, Troy, VT A beef-cattle farm that also has a sugarhouse. Website here. Cross Road Sugaring Company, Ira, VT Website here. Vermont Maple Outlet, Jeffersonville, VT Seventh-generation maple farmers, according to their website. Ledge Haven Farm, Orwell, VT Website here. Amber Ridge Maple, Essex Junction, VT Website here. Macomber Mountain Farm, Underhill, VT Website here. Beaver Meadows, Craftsbury, VT Website here. Palmer Lane Maple, Jeffersonville, VT Website here. Baird Farm, North Chittenden, VT Website here. Sugar & Spice, Mendon, VT Website here. Green’s Sugarhouse, Poultey, VT Website here. Mom & Pop’s, Rochester, VT Since 1918. Website here. Taft’s Milk & Maple Farm, Huntington, VT Website here. Double Diamond Sugar house, Brownsville, VT Website here. Sugartree Maple Farm, Williston, VT Website here. Robb Family Farm, Brattleboro, VT A beef and maple farm. Website here. Bill’s Lakeshore Maples, Newport, VT Website here. Mount Pleasant Sugarworks, Leicester, VT Website here. Krueger-Norton Sugarhouse, Shrewsbury, VT Website here. Merck Forest & Farmland Center, Rupert, VT A nonprofit environmental-education center. Website here. Echo Hill Farm, East Craftsbury, VT A fourth-generation oepration. Website here. Smith Maple Crest Farm, Shrewsbury, VT Website here. Goodrich’s Maple Farm, Cabot, VT Family owned since 1840, according to their website. Allen Family Maple Farm, Starksboro, VT Website here. Maple Knoll Farm, Springfield, VT Website here. Ox Pasture Maples, East Berkshire, VT Website here. D&D Sugarwoods, Glover, VT Website here. The Maple Hut, Agawam, MA A small operation–in 2012 they produced just 17 gallons of syrup. Website here. Dave’s Sugar House, Ashby, MA Website here. South Village Sugarhouse, Ashby, MA Website here. Cranston’s Christmas Tree Farm, Ashfield, MA Website here. South Face Farm, Ashfield, MA Website here. Desjardins Maple Syrup, Belchertown, MA Website here. Occasional Creek Maple, Belchertown, MA Website here. Shattuck’s Sugarhouse, Belchertown, MA Facebook page here. Blue Heron Farm, Charlemont, MA Website here. Hager Brother Farm, Colrain, MA Dairy cows and maple syrup. Williams Farm, Deerfield, MA Website here. North Hadley Sugar Shack, Hadley, MA Website here. Ioka Valley Farm, Hancock, MA Beef cattle, with maple syrup as a sideline. Website here. Berkshire Sweet Gold, Heath, MA Website here. Davell’s Farm, North Attleboro, MA Website here. The Warren Farm, North Brookfield, MA Website here. Round Mountain Farm, Northfield, MA Website here. Deer Hill Maple, Plainfield, MA Website here. Fournier’s Sugarhouse, Plainfield, MA Website here. Thatcher’s Sugarhouse, Plainfield, MA Website here. Gould’s Sugarhouse, Shelburne, MA Six generations making maple syrup, according to their website. Turner Farms, South Egremont, MA Website here. K.E. Farm, Sturbridge, MA Website here. Matfield Maple Farm, West Bridgewater, MA Website here. Mayval Farm, Westhampton, MA Dairy cows and maple syrup. Website here. Land’s Sake, Weston, MA Website here. Brookledge Sugar House, Whately, MA Website here. Lawton Family Sugarhouse, Williamsburg, MA Making maple syrup for seven generations, according to their website. Sweet Brook Farm, Williamstown, MA Website here. High Hopes Farm, Worthington, MA Website here. Justamere Tree Farm, Worthington, MA Website here. Warrup’s Farm, Redding, CT Website here. Lamothe’s Sugar House, Burlington, CT Website here. Sweet Wind Farm, East Hartland, CT Website here. Durham Sugar House, Durham, CT Website here. Bureau’s Sugarhouse, Old Lyme, CT A maple farm whose chief product is maple-flavored popcorn. Website here. Maple Leaf Farm, Canterbury, CT Website here. River’s Edge Sugar House, Ashford, CT Website here.